Here are some guest comments about their visit! This was my first time booking a vacation home for myself and 10 other people and I was extremely nervous! Scott responded to my email immediately and walked me through everything. He made it clear he would be there if I had any questions or concerns and he absolutely was. The property was amazing. The view when you walk in is unforgettable and the house itself was stunning. It’s the perfect place for all types of vacations, relaxing, family reunions, throwing a few back with some friends etc. The housekeepers were very nice and helped us with anything we needed. I highly recommend staying here. I couldn’t have asked for a better experience. El Fin Del Mundo is a very special place. Much more than a beach house, it is a beautifully decorated casa with incredible ocean views. The large ocean front porch provides a separate place for whatever the renter wants to do – sun bathing, reading, Jacuzzi, or margaritas at the taco bar. As an added bonus the beach and ocean are very safe for young children who have a ball running on the sand dunes and playing in the tide pools. I cannot imagine any renter, no matter the age, not enjoying this house immensely! This property has everything we could have hoped for. The patio with outside bar, and lounge chairs are perfect for all day, into happy hour and finally stargazing. The kitchen has all the things you need for large groups-not to mention the maid service every day to take care of the clean up. And the views are unsurpassable with a great expanse of beach at low tide and abundant sea life entertainment all day long. If there were any issues to be taken care of, the property manager was there in minutes. The home and its amenities contributed to a great weekend! So you know how when you walk into a five-star resort lobby everything is perfect everything has its place is a nice fragrance about the place good views a hotel hostess or Concierge waiting to greet you that was our experience when we got to this beach house . The 180° view from the living room kitchen and most of the bedrooms is going to be surpassed by the construction of this house with inlaid bric dome ceilings a fireplace in every room tile throughout niches in artwork and lights and a stereo system that rocks like none other .The dining room table is fit for Kings it’s a wood slab made from an old Mexican church door that is like I said fit for a king we said 12 people at the dinner table and had many many great conversations and dinners while being served by the chef on duty. Oma the housekeeper came every day made the beds swept the floors did all her dishes from the night before cleaned up all of the ashtrays inside and outside and generally made that house spotless as you would expect a five-star resort to be taken care of . The home itself was cozy and warm with luxurious overstuffed cushions and plenty of seating for a party of 16 there was outdoor setting lounge chairs and chairs under the shade and an outside dining room and outside living room and outside kitchen bar not forget the heated swimming pool negative edge overlooking the ocean . I have stayed at several beach homes in the area and throughout the world and this is my number one pick Scott you’ve outdone yourself as being a host an owner of this home we shall be back thank you very very much . 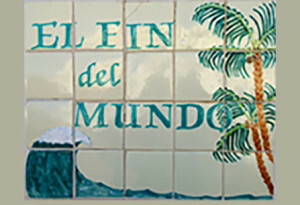 El Fin Del Mundo ranks right at the top for vacation accommodations and amenities. We travel extensively and have experienced many condos, villas, and resorts. We especially appreciate the privacy El Fin Del Mundo provided. The beach was just a few steps off the veranda and the view of the Sea of Cortez is absolutely stunning. We enjoyed walking the beach and seeing the great variety of birds and sea life. Our visit was easily one of the most relaxing and enjoyable vacations we have ever experienced.